How did Day 1 and Day 2 of your Spring Clean go? Open a few windows to let that fresh spring air in and let's get started! Choose one deep clean task for today. You can even finish the one from yesterday if you need more time on that task. Click here for a list of suggested tasks. Yesterday we cleaned the showers, tubs, counters, sinks, and toilet surfaces by simply spraying everything in one round and wiping it clean with a damp cloth in a second round. Today you are also going to do two rounds. Make a round to each bathroom and spray cleaner into the toilets. While this is doing its "magic", you can make a second round to wipe mirrors clean with a glass cleaner. This same cleaner can be used to shine up the chrome. Use a toilet brush to scrub the toilet bowl clean and move onto the next bathroom. It's that easy. Spray the toilets, wipe the mirrors and chrome, and swish the toilets with a toilet brush. I like to use glass cleaning wipes to make things even easier. Take a basket or bucket with you to carry all of your supplies with you to each bathroom. You wouldn't believe the time that this can save. One load. Wash, dry, fold, and put away. Done! 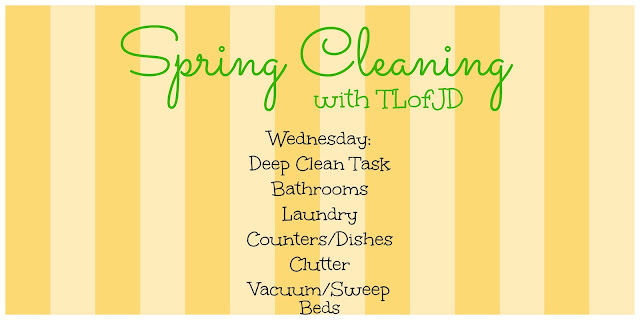 Take care of any dirty dishes throughout the day and clean the counters in the evening. Use a "clutter basket" to pick up any clutter at the end of the day and put it away in its proper place. Spot clean the floors as needed.